Welcome to the jungle, I mean, my balcony! If you had told me 10 years ago that someday I would be into gardening I would have laughed. Funny how things changed... when we moved into our new apartment six months ago and saw how enormous my balcony is (it's the length of the living room and one of the bedroom) I knew right away that I wanted to turn it into a garden! Over the past few months, we made countless trips to Home Depot (to the point where my fiancé started to loathe that place), we (mostly just me) went on an emotional rollercoaster of "yay my plant looks awesome" and "oh no please don't die", and now here I am with my dream garden! It might not look as good as I first planted everything but that's what gardening is all about right? You just keep at it and eventually things will bloom and flourish, well, hopefully! If you miss part 1 of my apartment tour last week, you can check it out here. Black and white hand painted planter c/o ScottAve. Ceramic planter c/o Susan's Ceramics. 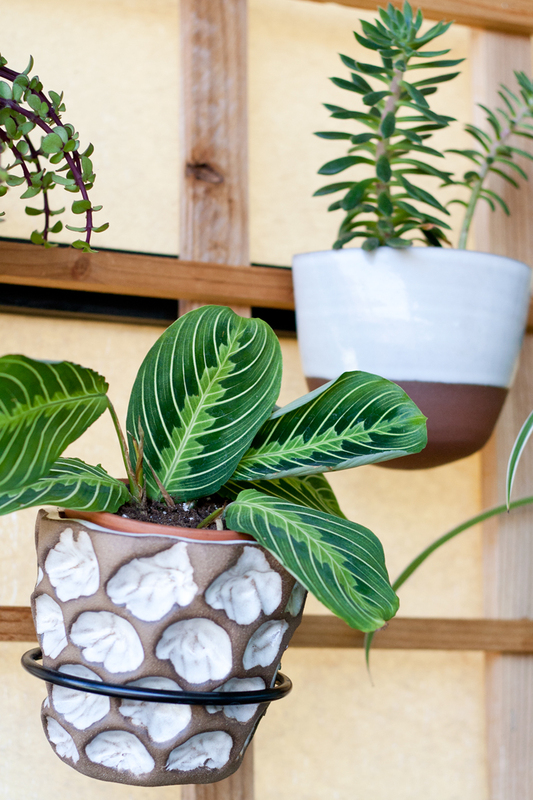 Glazed wall planter c/o Rhyno Clayworks. I am wearing: Knotted knit headwrap from F21. 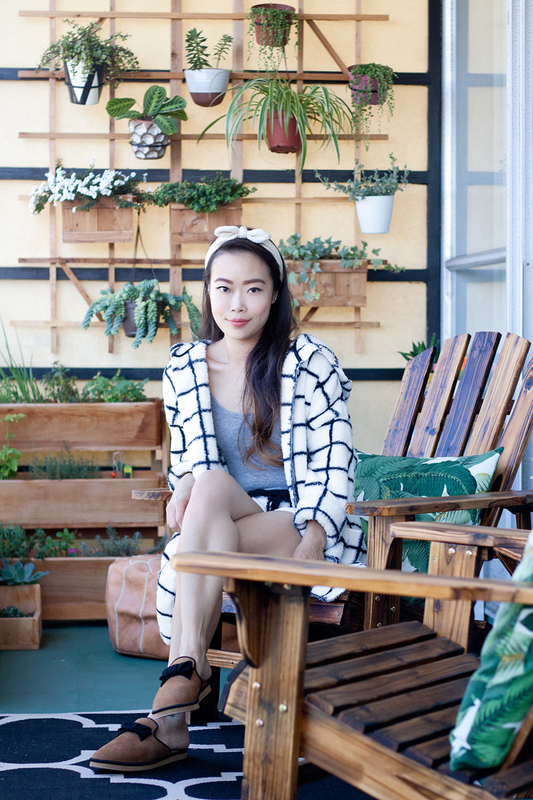 Cozy check cardigan and shorts c/o PJ Salvage. Daria leather and shearling slippers c/o Jacques Levine. 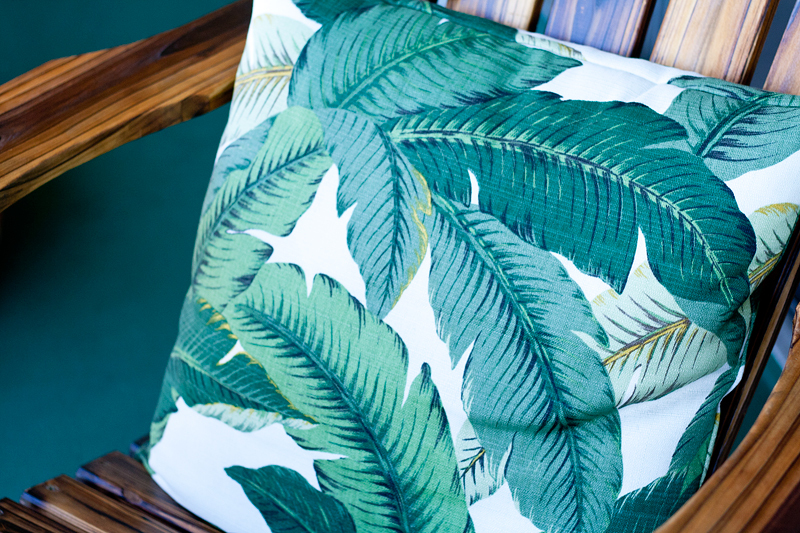 Tropical palm print pillow covers c/o Whitlock & Co. 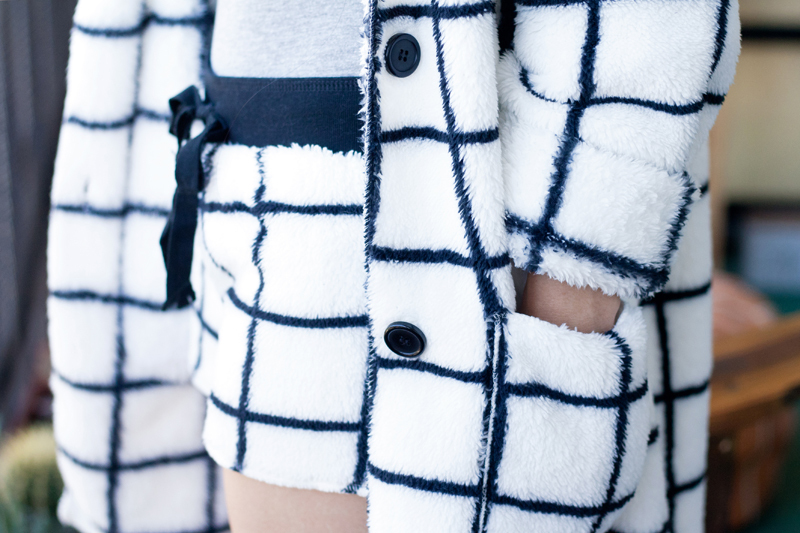 Cozy check cardigan and shorts c/o PJ Salvage. 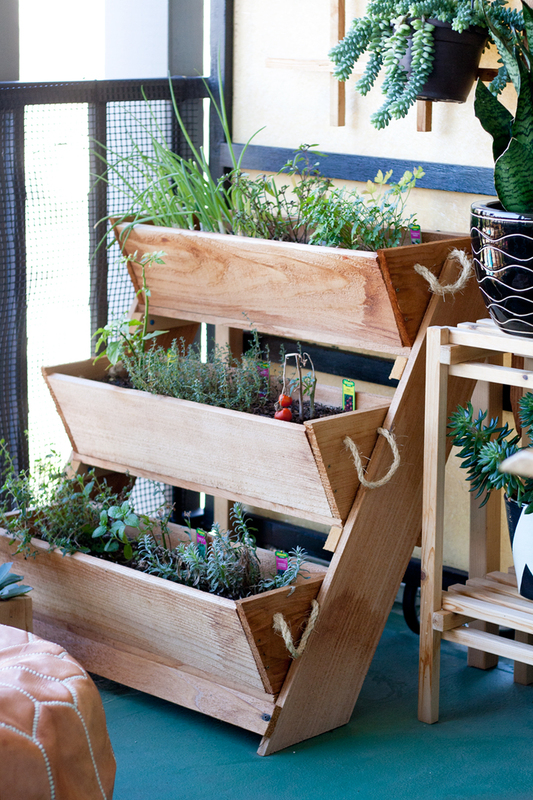 Three-tier cedar planter gardening system c/o Roped on Cedar. This is where I plant all my herbs and edible plants! 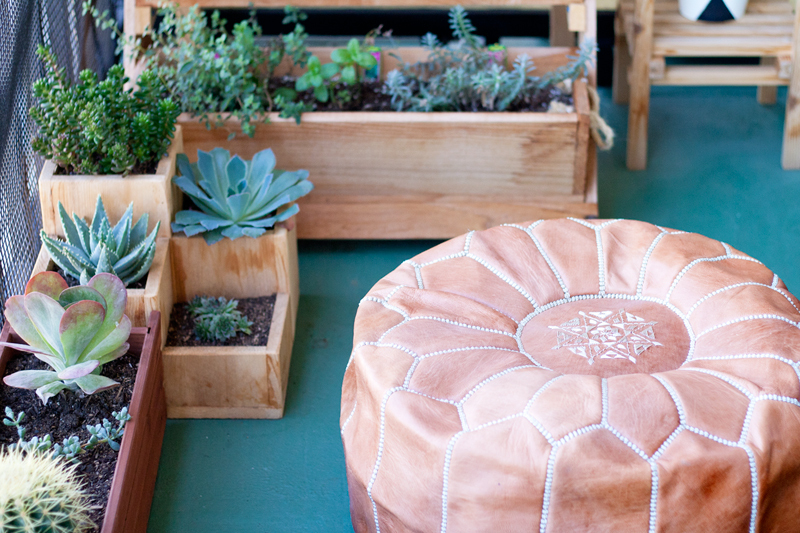 Handmade natural Moroccan leather pouffe c/o Beyond Marrakech. 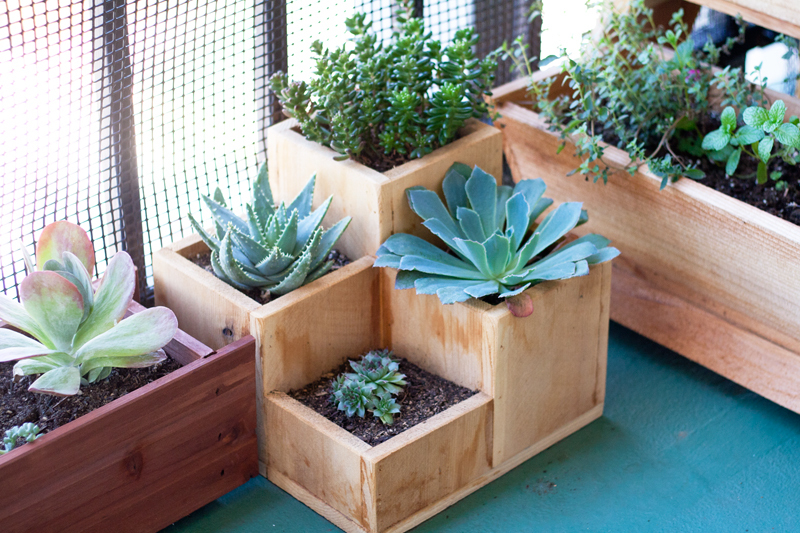 4-compartment succulent planter c/o Red Cedar Woodcraft. Two-tier cedar plant stand c/o Made in Farmington. 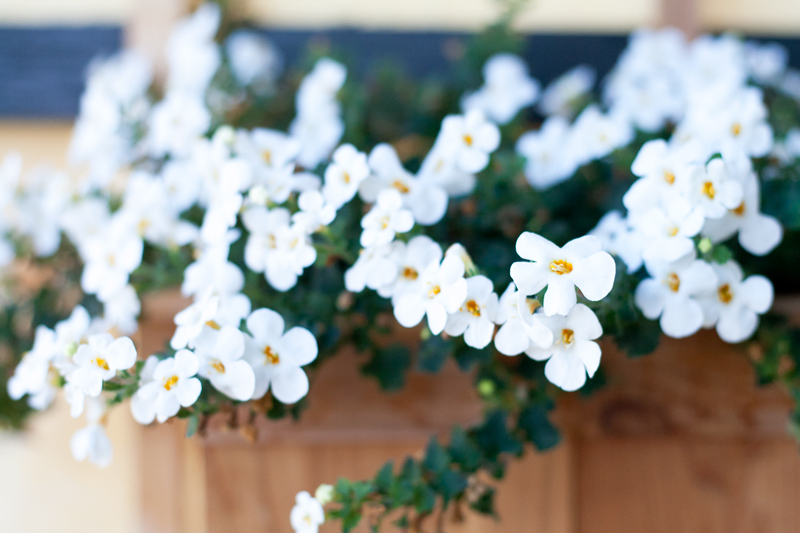 White and black hand painted planter c/o ScottAve. Mustard yellow planter from Michaels. 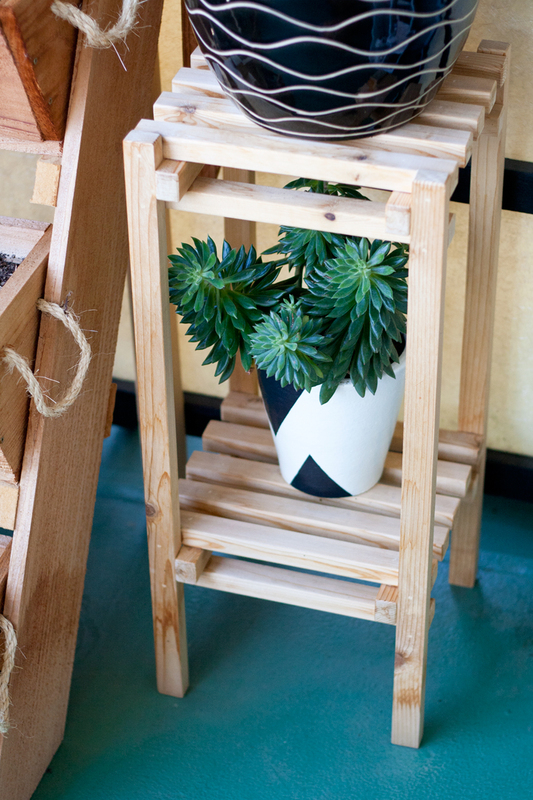 Black and white carved planters c/o Veak Ceramics. Black and white wave pattern planter from Michaels. 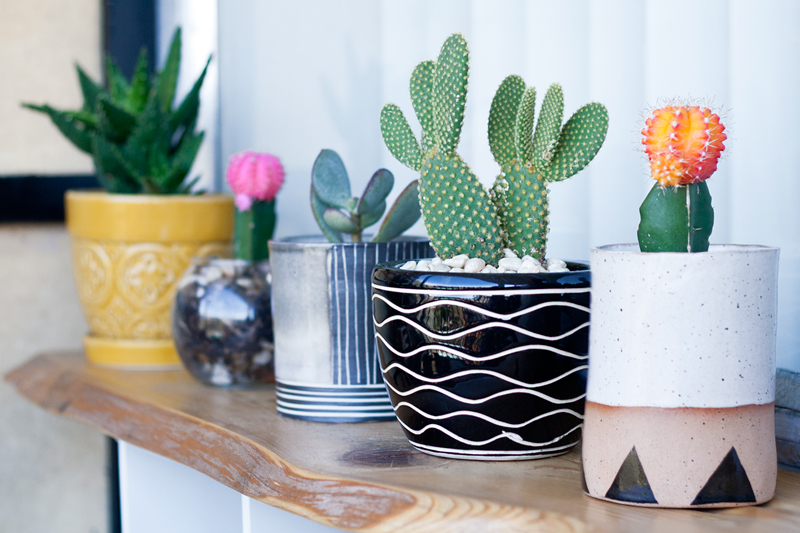 Two tone triangles ceramic planter c/o Martina Thornhill. Ceramic planter c/o Susan's Ceramics. Glazed wall planter c/o Rhyno Clayworks. Adirondack chairs and side table from Bed Bath & Beyond. Black and beige courtyard outdoor rug by Safavieh from Kmart. 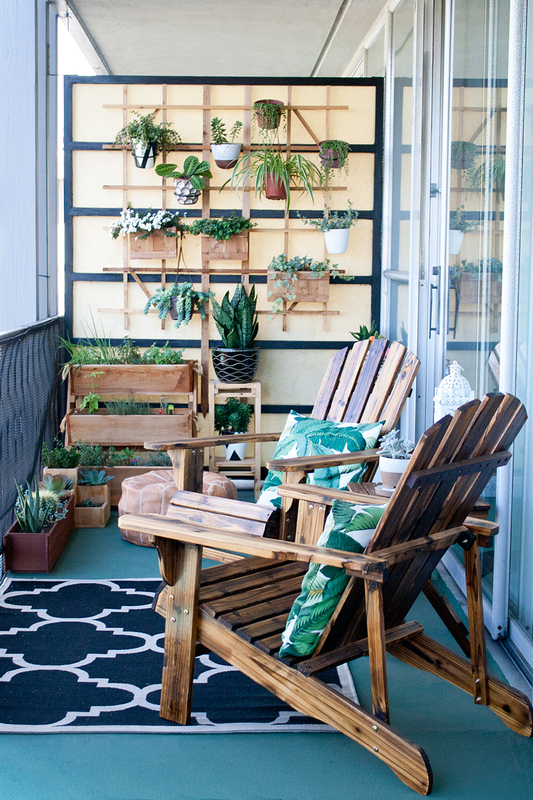 I love your outdoor space! What is the black mesh-y netting you have attached to the balcony bars? I need something similar so my cats can enjoy the balcony, too! Thank you! My apartment complex has the netting on all the balcony so it was already there! I am not sure what it is but I am sure you can find something similar at home depot. And it's really just a sheet cut to the size of the bars and secured by zippy ties! I have two cats but I am too scared to let them out on the balcony even with the net. I am afraid they would try to jump over (I'm on the 3rd floor)! Such a stunning balcony! 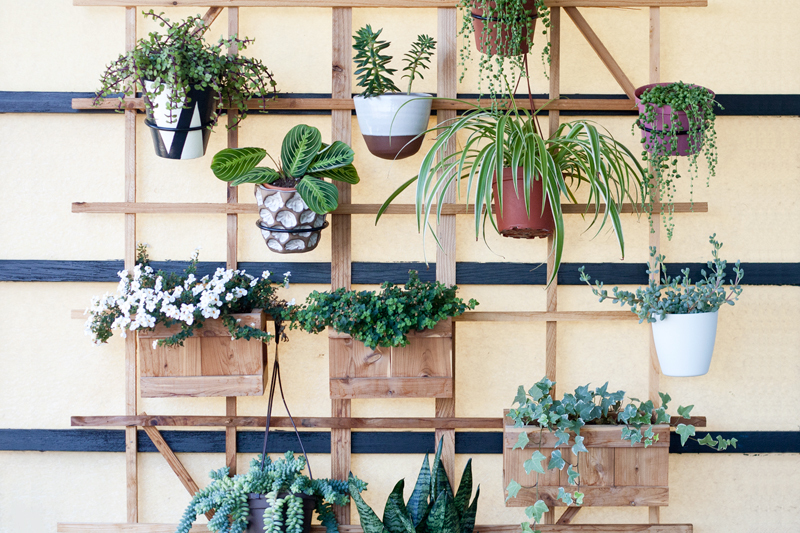 All your plants look so healthy and beautiful! If only I could keep mine alive. Wow your balcony looks better than my whole house! Hard to believe you only moved in 6 months ago.